According to the CDC, 1 in 59 children are now diagnosed with Autism Spectrum Disorder. 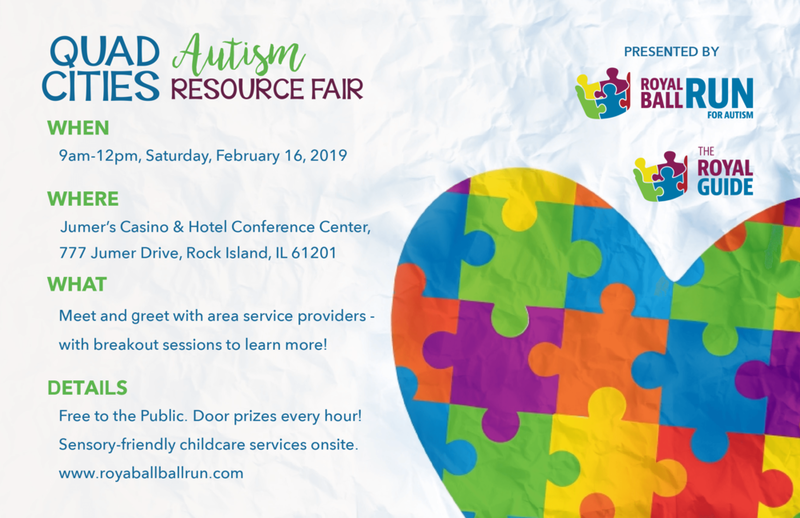 The Royal Ball Run for Autism will be hosting the 2nd annual Quad City area Autism Resource Fair to introduce families to over 40 local service providers which offer resources, support, and programs that can help. During the resource fair, the RBR organization will unveil the first-ever Quad City area comprehensive autism resource guide – The Royal Guide. Seeded with a donation by the Quad City Parrothead Club, the online guide includes traditional services such as speech and language therapy, guidance for where to turn for a diagnosis, and even parent-recommended referrals for service providers such as dentists, daycares and barbers. All listings in the resource guide were recommended by parents and were then contacted to be included. More information and a link to the guide will be shared during the resource fair.